It's taken me an unusually long time to find something to say about Homo Deus. I've been struggling to come up with a way of describing it that would both do it justice and elaborate some of my frustrations with it. 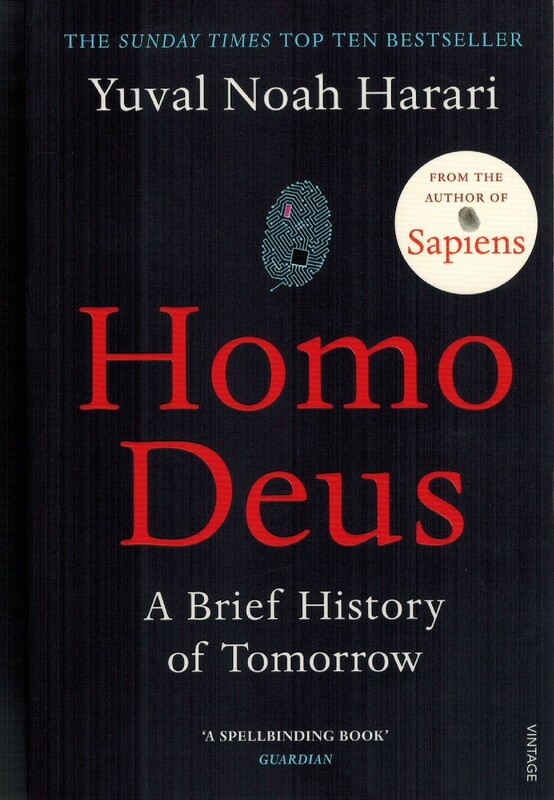 Just as its predecessor Sapiens, Homo Deus has been received with almost universal acclaim. It has a sense of gravitas and distinction that raises it above many better books. I couldn't quell a feeling of history-in-the-making as I read chapters on the nature of fiction, spiritualism and data, while simultaneously feeling extremely frustrated with Harari's extravagances and general pomposity. A friend had an accurate description of Homo Deus: if you take everything at face value, you are either extremely gullible or will never finish it. Harari has opinions. You will agree with some and disagree with others. So expecting to read Homo Deus in the same state of mind as you would read something like Alexander Hamilton's biography (as I'm currently doing), will inevitably result in disbelief at the amount of leeway Harari has taken. Parts of Homo Deus recall editorials in science journals and in some ways the book is just several of those strung together. I've always been a fan of telling stories through examples, and this is where Sapiens and Homo Deus diverge most. Sapiens was a riveting read, because it could enlighten the reader with stories of early humans and modern history. Those stories were the backbone of the book, and served to prop up other, more speculative, parts. Homo Deus is largely devoid of anecdotes, especially toward the end. This is understandable, as Homo Deus has less source material to go on. The future is unwritten, and Harari's goal is to look as far into the future as possible, so theorizing is the more common mode by default. All this doesn't mean that Harari's message isn't important, even vital. As humans, we are so focused on daily drudgery that slower changes seem not to register. Harari succeeds at taking several steps back and looking at changes that have been brewing for decades or centuries. With the decline of religion and the lure of individualism, humanity has lost its sense of purpose. If there is no god, and humans are mostly (or wholly) algorithms that react to changes in their environment, how can there be free will or meaning. These questions have been posed by others before, but Harari ties them into a larger discussion of where humanity is headed. It is an important, but partly demoralizing debate. More than with any other book, I struggled to give Homo Deus its due. I absolutely loathed reading some chapters. Harari goes on for pages in the style of "By equating the human experience with data patterns, Dataism undermines our main source of authority and meaning, and heralds a tremendous religious revolution, the like of which has not been seen since the eighteenth century.". As important as the message may be, his prose is too overbearing at times and he can't resist shoehorning in his personal opinions (on meat production, for instance). I struggled to finish it, because of its faults. Yet, I have a feeling that Homo Deus will come to mark an end of an era, as artificial intelligence overcomes human intelligence. As a guide to that future, Homo Deus is the undisputed leader.